The Town of Estes Park has been working for months on the new addition to their event facilities. Dubbing the former fairgrounds as the Estes Park Events Complex, Town staff is preparing to unveil the new Estes Park Event Center and Pavilion. The new facilities are expected to open in May and will add large-scale, indoor event space to the 2,700-seat grandstand and outdoor arenas currently offered, making the Estes Park Events Complex much more versatile. The new Estes Park Event Center is a 33,000 square-foot facility that will accommodate large events from expos and conventions to indoor festivals and sporting events. Complete with concession capability, in-house catering services, meeting rooms and available rental equipment the new building offers new opportunities to the Town&apos;s events department and area event planners. "When you enter the Event Center, the Grand Lobby will welcome you with beautiful mountain décor," said Karen Lynch, Marketing & Sales Manager for the Town of Estes Park. "Beyond the lobby are large picture windows that offer an impressive view of the 25,574 square-foot Multi-Purpose Event Hall below." The adjacent Pavilion building also offers flexible space, and is 19,184 square feet. The two new buildings will complement each other, as well as the current fairgrounds facilities and the Estes Park Conference Center. The complex can be utilized by existing events; at the same time, the complex managers are looking for new opportunities. "The two new buildings truly open the door to a variety of new markets, year-round entertainment and unique celebrations," said Lynch. "With a well-rounded, dynamic events complex like this, the possibilities seem endless - we expect it will draw new guests to Estes Park through all seasons." Having expanded indoor event options will allow for additional year-round events and celebrations, helping to sustain Estes Park as a year-round travel destination. The large spaces and the array of accommodating equipment are able to accommodate large-scale concerts, conventions, trade shows and sporting events. The inspiring setting also helps to attract these types of events. 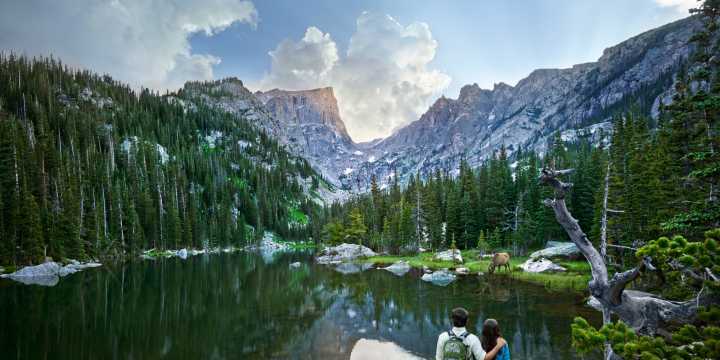 "Event planners are not only looking for the right building or facility, but often for something more that will increase attendance and inspire their participants, said Lynch "With the beauty of Rocky Mountain National Park and all there is to do in Estes Park, event participants and attendees will have incredible experiences beyond what the event offers on its own." The Town of Estes Park broke ground on June 6th, 2013 and both buildings are expected to be open by the end of May, less than a year later. The Event Complex will be kicking off with an opening celebration and the first official event to be hosted in the Events Complex is the popular Wool Market, June 7-8, 2014. The Event Center and Pavilion were funded by the Town of Estes Park. Learn more about the new Estes Park Events Complex by visiting the website at www.EstesParkEventsComplex.com. To inquire about rental rates, open dates or facility amenities, contact Karen Lynch at KLynch@Estes.org or 970-577-3956.